Kids love biking. But it’s a national shame that only 2% of children cycle to school. Programmes such as Bikesafe (Auckland) and Pedal Ready (Wellington) show that with encouragement and facilities, this trend can be reversed. The timing is right to roll out a national programme. Cycling is great for kids’ independence, mobility, fitness and health. 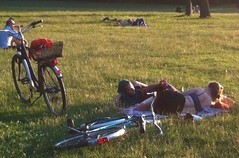 Biking is fun for all the family. More kids on bikes reduces congestion at rush hours, freeing up valuable road space. Health, children and families, education, transport, economy, climate change. Set a nationwide target to challenge and inspire parents, schools, councils to act now. Fund NZTA to set up an umbrella Kids on Bikes programme. 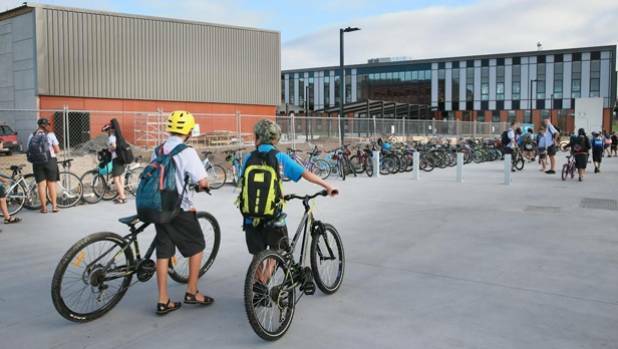 NZTA to partner with councils, schools and parents. Building a positive culture and a safe physical environment are the keys to success. Set a national policy that a 30kmh safe zone should be around all urban schools and relevant rural schools, not the current 40kmh for some schools. The Urban Cycling Programme is investing $333 million of seed funding over 3 years (2015-18) to be matched by 15 councils with specific cycleway projects. The UCP has been a most welcome step in the right direction. As a one-off it has limited value. Sustained investment over time will reshape existing streets to create safe cycling networks. Change in public spaces doesn’t occur smoothly unless we bring communities along for the ride. A positive share-the-road culture must be embedded with effective campaigns just as wearing safety belts and drink/drive campaigns changed attitudes. Bicycle-friendly cities are internationally attractive to live and work. They draw in the best talent – people and businesses who want a great quality of life. Bicycle-friendly cities are more prosperous, healthier, have lower emissions, and offer better transport choices for more people. The political role is leadership. City planning and road control is local government’s job. Detailed layout decisions and community consultation are best done by them. But they work within national frameworks and transport is co-funded by central government. If the government of the day decides to build up Christchurch, Wellington, or Auckland as a bicycle mecca comparable with Amsterdam or Copenhagen1 within 20 years, it will be done. Economy, tourism, transport, health, climate change. Lead the building of bicycle-friendly cities. Reflect this through every policy directive: the Government Policy Statement on Transport, NZTA funding policy, specific Ministry of Transport and NZTA policies such as road safety guidance, NZTA’s One Network Road Classification, and political media statements and focus. Commit to ongoing annual funding for cycling infrastructure starting at the levels of the current Urban Cycleway Programme. Direct NZTA to work with councils to make sure projects are delivered and funding achieves the benefits. Invest in communicating with communities and road users to support and promote the direction. 1 40% of trips in Copenhagen are by bicycle – despite the snow. They are aiming for 50%. 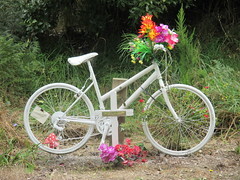 Vision Zero – no deaths or serious injuries on New Zealand roads. Far too many people are harmed on our roads. Deaths and injuries are undervalued, traded off against economic gains assumed to result from faster movement of motor vehicles. Urban road speeds are in many situations too fast to be safe. Save lives. Lessen the burden on the health system and ACC. Widen people’s transport choices: more will feel confident to walk or ride on slower roads. Implement in the next term all of the Cycling Safety Panel's 2014 recommendations. The Panel was set up after cyclist deaths in 2013. Reduce speed limits to safe levels appropriate to the situation. NZTA’s One Network Road Classification (ONRC) system to remove parking, provide cycleways on arterial routes, lower speeds on local streets, in a consistent manner nationwide. Encourage local councils who make positive changes. 110kmh speed limits only on motorways that cyclists and pedestrians are legally not able to use. Faster speeds are not safe regardless of road quality if cyclists and pedestrians use the roads. Build separate cycle lanes from motor vehicles on higher volume/speed urban and arterial routes. Create a connected network of safe cycle routes so people can make entire journeys in safer environments. Refocus vehicle safety on the safety of people outside the vehicle. Heavier or larger vehicles pose a greater safety risk to cyclists. Lower the speed limits for those vehicles, and eliminate drivers' blind spots. The Safer Lorries Scheme in London reduced blind spots on trucks. Continue education for truck drivers and cyclists, such as CAN's successful Share-the-Road programme. Provide cyclists with sealed shoulders on rural roads. Fix black spots, narrow bridges, and dangerous intersections. Separate cyclists from pedestrians. Shared paths should be used sparingly. They are not a good solution for many situations. 2Implementing lower speeds in New Zealand. Dr Glen Koorey, NZTA Senior Lecturer in Transportation Engineering University of Canterbury, 2011. New Zealand is getting on the bicycle map with more rides and better publicity. Cycling tourists stay longer and spend more in local areas. Keep up the focus and investment. Improve service for bikes in rebuilds of earthquake-affected areas. Active communities are healthy communities. Promote cycling to fight obesity, heart disease, cancer, diabetes, and improve mental health. A recent Otago University study confirms the health benefits of regular walking and cycling. Enforcement is a critical part of the cycle. Such as: dynamic-direction lanes, 2-way for bikes along 1-way smaller roads; car/ride-sharing apps, trip-planning software, road congestion-pricing. so that people can get to the places they want without having to travel long distances. And more efficient public transport between suburban centres carrying cycles.